Hello, Lovelies! Here’s another yummy, easy way to use up some of that fresh mint that’s taking over your garden. I’ve been using ours to make: FRESH MINT TEA, HERBAL SIMPLE SYRUP, CARROT SALAD, REFRESHING SUMMER TEA SANDWICHES, WATERMELON & GREEN TEA FRESCA, WINE SLUSHIES, TABBOULEH SALAD, MELON WITH MINT, HEALTHY POTATO SALAD WITH YOGURT & MINT, and MINT JULEPS. Fresh mint sprigs make a beautiful, fragrant garnish for fruit pizzas, iced tea, lemonade, summer cocktails and fruity desserts! 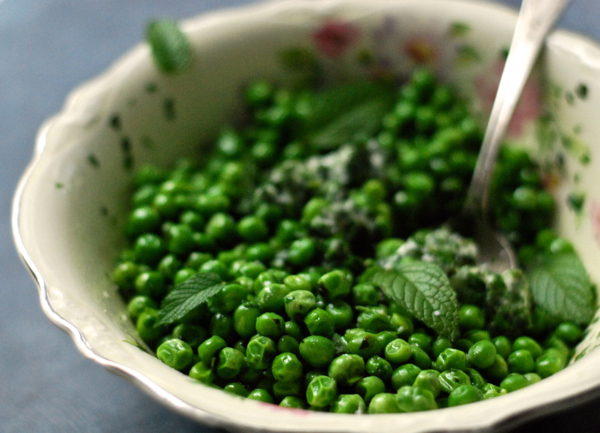 And…one of my all time favorite ways to use my fresh garden mint… THESE delicious, minted peas. I’ve been making these for years. I hope you enjoy them as much as we do. We had some last week with delicious, grilled steaks and baked potatoes. They’re also a lovely accompaniment to grilled fish and my husband’s recipe for BBQ BEEF. Steam peas until bright green and tender. Don’t over-cook. Place peas in a medium bowl and toss with the rest of the ingredients. Serve immediately with your favorite summer fare! This dish looks fantastic. I cannot wait to try it out! Always something good cooking in your kitchen. This certainly takes the humble pea to a whole new level, YUM!